Myrmecophytes are plants which live in a symbiotic relationship with ants. The acacia species Acacia hindsii, which is native to tropical dry forests in Central America, is such a myrmecophyte. Its inhabitants are ants of the genus Pseudomyrmex. The ants depend completely on their host plants for nectar and the food bodies rich in proteins and lipids which they require. The acacia also provides shelter, the so-called domatia, in the hollows of its swollen thorns. In return for room and board, mutualistic Pseudomyrmex ferrugineus ants become bodyguards, protecting their host against herbivores and competing plants. However, some ants also benefit from the plant's services without giving anything in return, such as the parasitic ant species Pseudomyrmex gracilis. Scientists at the Max Planck Institute for Chemical Ecology have now looked more deeply into the insect-plant interaction, asking whether the tiny bodyguards also provide protection against microbial pathogens. 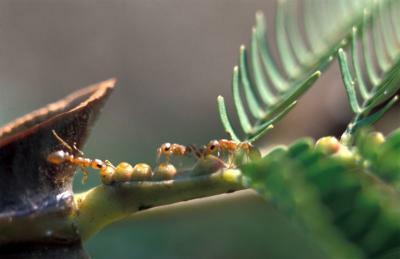 They compared the leaves of acacia plants which were inhabited by either mutualistic or parasitic ants to leaves from which ants had been removed. Intriguingly, the leaves of acacia colonized by parasitic ants showed more leaf damage from herbivores and microbial pathogens than did the leaves that had mutualistic ants. The presence of the right symbiotic partner seemed to have a positive effect on the plant's health. 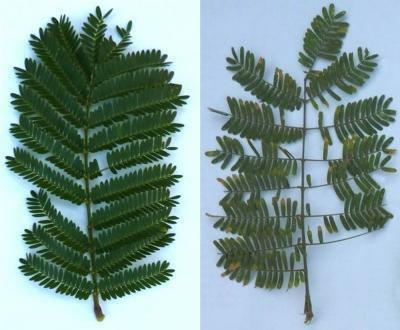 Leaves of Acacia hindsii plants colonized by mutualistic (left) or parasitic ants (right). Plants associated with the mutualistic ant species Pseudomyrmex ferrugineus are visibly healthier than their neighbors. Analysis of the surfaces of the leaves revealed that the number of plant pathogens as well as of necrotic plant tissues increased considerably when mutualistic Pseudomyrmex ferrugineus ants were absent. These plants also showed strong immune responses in the form of an increased concentration of salicylic acid, a plant hormone which regulates defense against pathogens. Detailed analysis of the bacterial composition on the surfaces of the leaves suggested that the presence of mutualistic ants changed the bacterial populations and reduced harmful pathogens. Although far less pronounced, this effect could also be observed in parasitic ants. How antimicrobial protection is transferred from ants to plant is still unclear. Chilean researcher Marcia González-Teuber, first author of the publication, suspected that microorganisms associated with the ants might play a role. Because acacia leaves are touched mainly by ants' legs, she extracted the legs of mutualistic and parasitic ants and tested the effect of the extracts on the growth of bacterial pathogens in the lab. Plant pathogen Pseudomonas syringae was sensitive to the application of leg extracts of both ant species and its growth was inhibited. In the next step, the scientist isolated and identified bacteria from the legs of the ants. In lab tests, bacterial strains of the genera Bacillus, Lactococcus, Pantoea and Burkholderia effectively inhibited the growth of Pseudomonas bacteria isolated from infected acacia leaves. Interestingly, some of the bacterial genera associated with the ants are known to produce antibiotic substances. Mutualistic Pseudomyrmex ferrugineus ants on an acacia plant. The ants love nectar from the plant's extrafloral nectaries.